I hate to use the word “viral,” as I tend to hate most buzzwords, but that’s my quirk. Nothing wrong with them. But I will say “viral” just this once. Can brands leverage social media to create a viral movement at little to no cost? Here is the thing about viral media: it can’t be manufactured. A brand can create something pretty cool and publish it, but they need to let go at that point, and let the masses take it and run with it. There are times where a piece of content has been published months before it blows up, and then suddenly it’s all you see on social media. Overnight, everyone is sharing it, and this shows how unpredictable this sort of thing can be. Here is a recent example of what Twitter can do for a brand. Some of you may have seen this hashtag recently trending on Twitter. For those who haven’t, what basically happened was that Carter Wilkenson, a 16-year-old from Reno, Nevada, tweeted fast food chain Wendy’s, asking how many retweets he would need to get free nuggets for a year. Wendy’s who also happens to have one of the best corporate social media teams at the moment, answered him: 18 million retweets. To put that into perspective, the most retweets for a single tweet belongs to Ellen Degeneres. In it, she tweeted a selfie from the Oscars with other celebrities, and it reached 3.4 million retweets. What is cool about Carter’s quest for free nuggets? Well if you’re a 16-year-old, free nuggets for a year is definitely cool (though you don’t yet realize how that is probably a terrible idea, eating that many chicken nuggets…). And here’s where the magic happens: there were most likely no long planning meetings by the Wendy’s social media team. All it took for everything to get off the ground was a relatively quick reply that cost Wendy’s next to nothing. Suddenly there’s this massive number of people and companies getting behind Carter. All around the world, people who had no idea who this kid was, are all helping Carter out, rallying for him, cheering him on. They didn’t need to know Carter, they just know of his quest for nuggets and want to help him out. And why? Because it creates a brief connection with other humans. Because it feels good to be part of something, as ridiculous as it is (and it IS ridiculous). And I think that THAT is pretty cool. Meanwhile on the marketing side, Wendy’s is suddenly getting massive attention and reach with a single tweet. The story has been on newscasts all over America, as well as major newspapers, and online media sites. As of writing, there are 3.2 million retweets, with thousands of people tweeting Wendy’s about it. Almost overnight, 3.2 million people were talking about Wendy’s, giving them even more leverage, more name recall, more publicity from one tweet. Let this sink in: One reply to a 16-year-old kid by Wendy’s is reaching people in numbers that they’d normally have to spend millions on with traditional advertising. I think that this once again is proof that social media is still as powerful and effective as ever, as rather absurd the context may be. Though of course, if you’re Wendy’s, I’m sure they find nothing absurd about the marketing monster they’ve created with a single tweet. But do you know you can also find value in social media as a realtor? Though probably not at such a massive scale as Carter’s and Wendy’s, know that the opportunity is there. There are plenty of posts on our blog that talk about ways to use social media for real estate, so I’ll leave you to skim through those to find something that resonates with you. 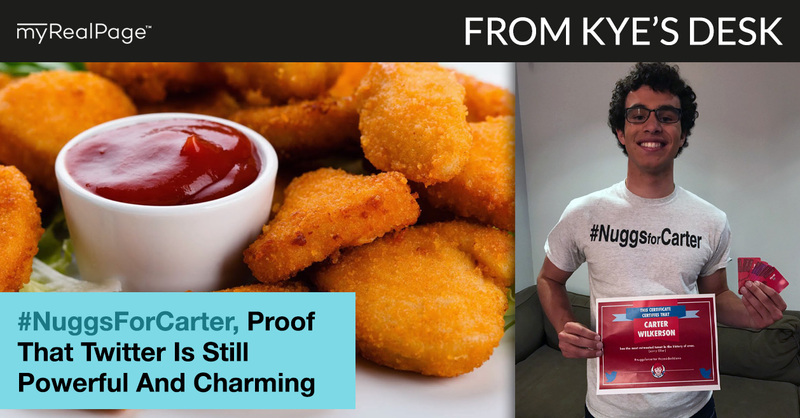 At the very least, you now know about Carter and his quest for nuggets, as well as how it suddenly got the Wendy’s name on millions of peoples’ lips overnight. And while you may think that all of this is either awesome or absurd, the numbers are there, and you can’t deny the reach that Twitter can offer when social media is used correctly. As of this writing, he is at 3.2 million retweets and climbing. Enjoy those nuggets, Carter. And to Wendy’s, well done! Kye Grace is the Director of Product and Service Development of myRealPage.com. Once a month, he publishes an opinion piece that focuses on topics such as real estate trends, online marketing, social media marketing, web development, and technology, all within the context of Canadian real estate, and helping realtors be more successful online. For questions and comments, feel free to use the comment form below. You can also follow Kye on Twitter @kyegrace.